According to the most recent disclosures, Kavanaugh has not held the types of investments that have forced justices to recuse from cases or sell off stock to avoid financial conflicts. U.S. Court of Appeals for the D.C. Circuit judge Brett Kavanaugh. Feb. 25, 2015. Photo by Diego M. Radzinschi/NLJ. 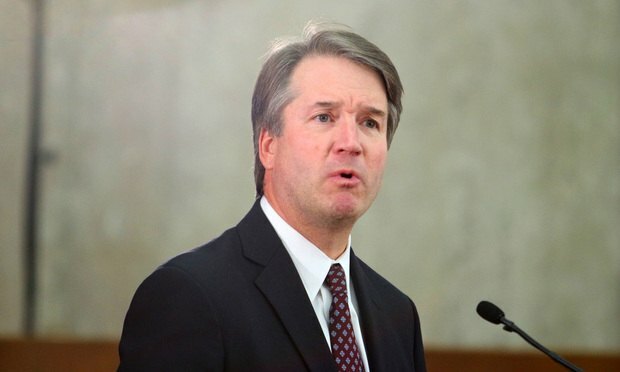 In 2015, Brett Kavanaugh watched the Arizona Cardinals defeat the Detroit Lions at Ford Field, joined by his former classmates from Georgetown Prep. His host that October weekend: Michael Bidwill, a friend from the class of 1983 and now the president of the Cardinals, whom Kavanaugh paid $500 as reimbursement for flights and a ticket to the game.